It was a cold night in November 1938. Hard men with hatred in their hearts and bats in their hands set about smashing shops belonging to Jews. At the end of the night, some 267 synagogues were destroyed, the windows of 7,500 Jewish-owned businesses were shattered and several Jewish cemeteries were desecrated. At least 91 Jews were killed in the mayhem. Up to 30,000 Jewish men were rounded up and sent to concentration camps. Glass from smashed storefront windows lay strewn across the streets. 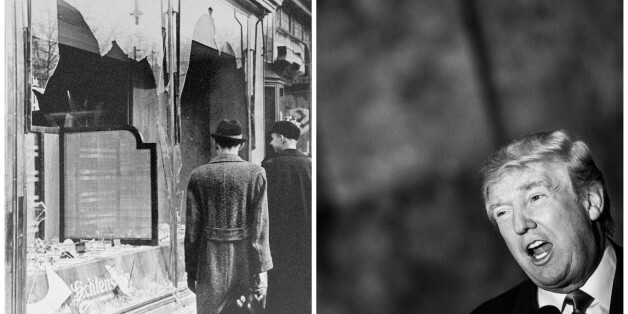 That night of infamy is notorious in history as Kristallnacht -- the "Night of Broken Glass." Today, we appear to be heading that way again -- this time with Muslims instead of Jews. Kristallnacht was justified by the Nazis as a response to the assassination of a German diplomat in Paris by a young Jewish man. Similarly, much of the current level of Islamophobia appears justified to many Americans because of the terrible and tragic killings by Muslims in San Bernardino and Paris. The San Bernardino killings were particularly horrific because they were likely committed by an American-born citizen and his wife. It was a double betrayal -- of their own Islamic faith, a religion of peace, and of their host country, which had accepted them and given them the American dream. Trump has taken the first tiny dangerous steps towards unleashing forces that could trigger large-scale violence against the Muslim community. The classic pattern from the fascist playbook has been: first abuse and demonize the minority community, then isolate it, then suggest violence and finally encourage and indulge in violence. We may not have, thankfully, reached the last stage, but we certainly are into the second and perhaps moving to the third stage. Here's why. Donald Trump, the leading presidential candidate for the Republican Party, has been focused on projecting Muslims in an extremely negative manner, with each of his statements more extreme than the last. When a man at one of Trump's speeches said, "We have a problem in this country. It's called Muslims ... When can we get rid of them?" Trump merely replied, "We're going to be looking at that and many other things." Last month, Trump said he was open to keeping a database of American Muslims or making them carry special ID cards that listed their religion. He talked of shutting down American mosques because "bad things are happening." He vowed, "We're going to have to do things we never did before," things "that we never thought would happen in this country in terms of information and learning about the enemy." A few days ago, he suddenly said that he would ban all Muslims from entering the United States -- a statement that caused a furor both in the United States and abroad, with even the British prime minister, who would normally not comment on an American election, objecting to Trump. Trump was exemplifying and enhancing the already existing Islamophobia in the U.S., which had been fed by well-known Islamophobic figures like Frank Gaffney. Yet Trump used Gaffney's dubious research to justify his policy of banning all Muslims from the U.S. The poll Trump cited was published by the Center for Security Policy, the think tank created by Gaffney, who is described by the Southern Poverty Law Center, which tracks U.S. hate groups, as "one of America's most notorious Islamophobes." The SPLC notes that Center for Security Policy reports serve "to reinforce Gaffney's delusions" about a Muslim takeover of the United States. The results of widespread American Islamophobia are tragic and apparent in the daily news. The list is long and I will only present some random examples from the past few weeks: Muslims have been physically attacked and abused with frightening frequency, even in schools and universities. A Moroccan taxi driver was asked by his passenger if he was a "Pakistani guy" and then shot. Mosques have been attacked and fired on, as have Muslim homes. Mosques and families have received phone calls promising that Muslims, including children and old people, "will be killed." Armed "militias" with masks on their faces have turned up outside an Islamic center. 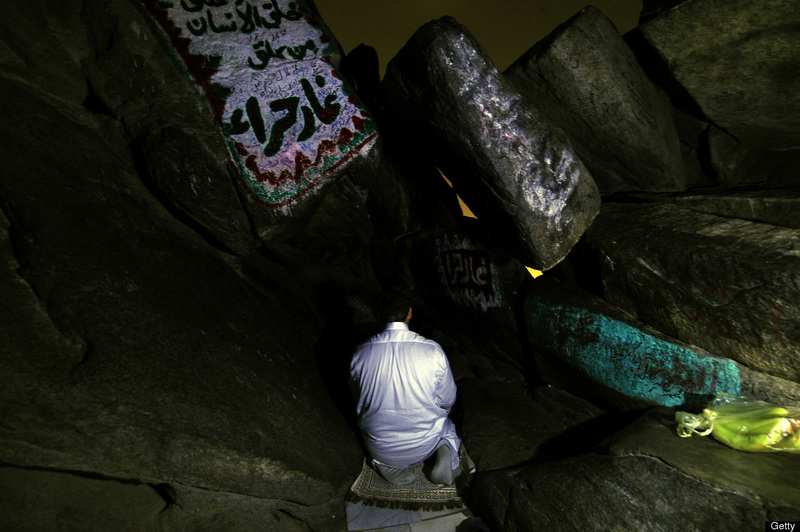 Heads of pigs have been thrown into mosques in defiance of the Muslim ritual prohibition of the animal. A disturbing amount of women and children live in abject fear and are reluctant to leave their homes. Recently, a man walked into a New York store and ferociously beat the Muslim owner, who had to be hospitalized, shouting, "I want to kill Muslims." To all this backlash the director of the Florida chapter of the Council on American-Islamic Relations commented, "The community is turning to us for protection, for safety, for guidance. We haven't been sleeping." He went on to draw a direct comparison between Trump and Hitler, adding, "I don't say this lightly." Muslim shopkeeper Sarkar Haq, who was beaten in an alleged hate crime, speaks during an interview at his shop in New York. JEWEL SAMAD/AFP/Getty Images. While I am not suggesting that Trump is another Hitler or even has Hitlerian sensibilities, there are some interesting similarities between the two. Trump, according to his former wife, is fascinated with Hitler and reportedly kept a book of his speeches by his bedside. Both Trump and Hitler are master opportunists who respond cunningly and swiftly to their political and social environment. Both identify passionately with the nation, tending to fuse their personality with that of the nation. Both are charismatic figures who appear to mesmerize their followers. The power of both rests on their public speeches and the hysteria generated in the gatherings. Both are vague on facts and on their promises to make the nation "great again." They have emerged in a time of economic crisis, political uncertainty and widespread fear in society. Both harp on the theme that the nation has been humiliated and that they will restore its honor. Both are political outsiders and mocked by the establishment -- note the critics making fun of the hairstyles of both, with Hitler providing additional opportunity with his mustache. Both Hitler and Trump have found that by keeping the focus of animosity on one unpopular minority as the source of all the ills of society, they can unite people and claim leadership when people are desperately looking for "strong leadership." Both are capable of cynically exploiting the mood against the minority and dialing it up or down based on what they think the audience would like to hear. Both blame the minority for threatening the equilibrium in society -- Hitler blamed the Jews for betraying Germany after the First World War and often cited the fictitious and anti-Semitic "Protocols of the Elders of Zion," and Trump blames the Muslims for being terrorist sympathizers who want to harm the United States. Both make up lies to promote their bigotry -- Hitler constantly cooked up facts about the Jews and Trump has been challenged on statements like claiming that he watched thousands of Muslims celebrating 9/11 in New Jersey. However much the similarities, there are differences: While Hitler was obsessed with the Jews -- "Mein Kampf" is replete with anti-Semitism, as was his last will in the bunker just before he shot himself -- Trump has had good relations with Muslims and often does business with them (only last year he was in Dubai promoting his new investments and praising the local leaders). But I am arguing that Trump does not seem to understand the dangers in the kind of rhetoric that he is using. While we may be a long way away from Kristallnacht, it is worthwhile to point out the signposts on Germany's path to that fateful night. If Trump does become president, and there are two big ifs for that to happen -- he has to get the party nomination and then actually win the presidency -- the discussion in this article will no longer be theoretical. Trump has taken the first tiny dangerous steps towards unleashing forces that could trigger large-scale violence against the Muslim community. The American pluralist vision must be defended as much from ISIS abroad as from the Trumps of the U.S., and in this battle, in the most profound way possible, Muslims need to be key allies. Thankfully, many Americans have responded to Trump in the true spirit of their pluralist identity. Democratic presidential candidates Hillary Clinton and Bernie Sanders have unequivocally criticized him. More significantly, the other Republican candidates who have also been making Islamophobic comments nonetheless felt it was necessary to condemn Trump -- Jeb Bush called his suggestion to ban all Muslims "unhinged" and Lindsey Graham told Trump to "go to hell." Akbar Ahmed is the Ibn Khaldun Chair of Islamic Studies at American University and has just released the film "Journey into Europe" which accompanies the book of the same title (Brookings Institution Press, Forthcoming). He conducted a major film and book project on Islam in America, both called "Journey into America."